Les Vins de Vienne was the name given to the wines of the Seyssuel region in the Roman times, which were reportedly of some repute. 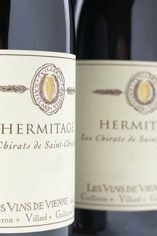 It is also the name given to the négociant firm and a domaine recently set up by three leading winemakers from the Northern Rhône, Yves Cuilleron, Pierre Gaillard and François Villard. For the domaine, the team have resurrected a long-neglected vineyard area on the steep hills in the commune of Seyssuel, a little bit further north of the town of Vienne, in the far northern reaches of the Rhône Valley. 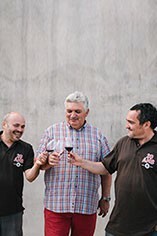 For the négociant business they have pooled their resources and genius to forge a new benchmark for négoçiant and domaine Rhône wines. From the smart aesthetics of the packaging through to the sheer class of the wines themselves, the operation has made a very big impression in a very short period of time. The wonderfully named Chirats de Saint Christophe is sourced from vines located in the top communes of Béssards and Le Méal. The wine has a real Hermitage power on the nose, but then as with all great examples, a wonderful finesse, a depth of fine Syrah fruit and an almost baletic elegance at its core.